Take your time for a fantastic 4 days private trip to Transylvania. This tour is packed full with attractions – for details, see highlights and program below! Alba Iulia – superimposed layers of ancient, medieval and modern history, and the second largest and well preserved Vauban citadel in Europe make an European Destination of Excellence! Scroll down the page for full program and description of the tour! Early set off from Bucharest, heading north towards the Carpathian Mountains. Arrival in Sinaia (two hours north of Bucharest) and visit Peles Castle, considered one of the most beautiful castles in the world, former summer residence of the Romanian Royal family. Cross into Transylvania to Bran and visit of Bran Castle, explore its twisting passages and staircases and learn the real story of Vlad Dracula, Prince of Wallachia and hero. Then continue to Brasov, hotel check-in followed by short orientation tour of the city and evening at leisure. 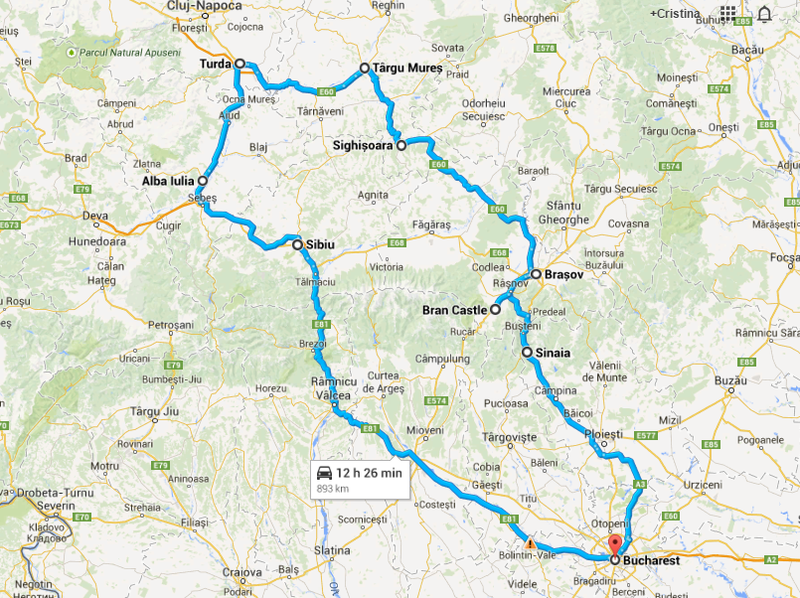 Today we travel to Sighisoara, on a journey through the plains and gentle hills of Southern Transylvania. This is the region of Saxon villages, known for the traditional villages, the Fortified Churches (several of them UNESCO sites) and for providing a rare image of an older Europe. Detour to the secluded village of Viscri, set amid gentle rolling hills, where you take a step back in time. Enjoy a truly authentic rural experience, century old houses and unspoiled historical landscape. Prince Charles was charmed and bought himself a vacation house in Viscri, having been a regular visitor since his first visit in 1998. Visit of the Fortified Church of Viscri, a UNESCO site. Arrival in Sighisoara, lunch at one of the local restaurants and tour of the medieval citadel, one of the last inhabited medieval towns in Eastern Europe. Enjoy the atmosphere of the narrow streets paved with pebbles and lined with sturdy centuries-old buildings. The landmark of the city is the Tower Clock, and the view from the top is a real treat. We spend the night in Sighisoara. Early departure from Sighisoara and change of scenery and atmosphere as the journey continues to Targu Mures, important city and cultural center of Transylvania, half Romanian, half Hungarian. We will stop for a drink and a stroll around the city’s central square, the beautiful Roses Square, where some emblematic landmarks are located such as the Palace of Culture, the symbol of the city, and the Prefecture Palace, both amazing Hungarian Secession style masterpieces. Continue our tour to Turda and get ready for a different experience, the Turda Salt Mine Museum, a 17th century salt mine now turned into a modern museum with spectacular amenities. Visiting a salt mine in Transylvania is relevant, as salt has played an important role in the history and economic development of the region from early times. Fact check, some of Europe’s largest salt reserves, and biggest and oldest salt mines, are to be found in Romania, at the borders of the Transylvanian Plateau and in the Sub-Carpathian Hills. Later, an encounter with history in the city of Alba Iulia, now welcoming at its best as result of thorough restoration of the entire historical site – possible contender for your favorite destination in Romania! Roman vestiges, 16th -17th c medieval fortification, a Vauban-type fortification (early 18th c, the second largest of this type in Europe), 1000-year old Roman-Catholic cathedral and the iconic Orthodox Cathedral of the Reunification, all in one place in Alba Iulia. Evening arrival in Sibiu. Spend the morning in the medieval Saxon town of Sibiu, regarded as one of the most beautiful and best preserved cities in Romania and Europe as well as one of the most important cultural centers. It is no wonder that Sibiu was designated European Capital of Culture in 2007. Enjoy its vaulted passageways, cobblestone streets, baroque facades, the cafés and the lively atmosphere. During the morning, short orientation tour of the city, followed by time for strolling at leisure. Main highlights: Piata Mare (Grand Square), Turnul Sfatului (Council Tower), Brukenthal Museum, Piata Mica (the Small Square), the Evangelical Church, the Goldsmiths’ Passage. In the afternoon, return to Bucharest via the scenic Olt River Valley. En route, stopover at the iconic Cozia Monastery.